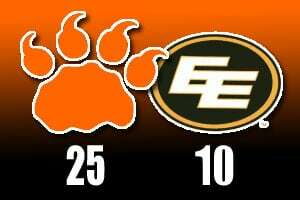 On Sunday in Edmonton’s Commonwealth Stadium, the BC Lions kicked off their 2010 campaign the right way, riding the feet of Jamal Robertson and Paul McCallum to a 25-10 win over the Eskimos. The new Lion Robertson racked up 168 yards and the team’s only touchdown, while elder statesman McCallum kicked the conversion and six field goals to account for the team’s tallies. Robertson and McCallum were far from the only bright spots for the Leos. Newcomer Derick Armstrong led the recieving corps, catching six passes for 73 yards while Geroy Simon and Paris Jackson snagged four apiece for 59 and 58 years respectively. The Lion defence, though, were the difference in the game, holding the Esks in check for most of the game. On the opening drive, Edmonton seemed to be testing rookie defensive back Stanley Franks, but a Korey Banks forced fumble snuffed out the Eskimos’ hopes to capitalize early– and seemed to serve to ignite the Lion defence. The Leo stalwarts would pressure Edmonton quarterback Rickey Ray, racking up five sacks on the night- two by Banks and one each by Anton McKenzie, Aaron Hunt and Solomon Elimimian. Keron Williams would recover the Ray fumble forced by Banks on the opening drive, turning the Esks away at the one-yard line. Between the resolute stands of the Lion D and McCallum’s feet, the BC offense was afforded the opportunity to find its footing, with McCallum accounting for the only scoring on his first of the night, a 44-yard field goal in the expiring seconds of the opening frame. McCallum would take the second tally as well, striking from fifty yards to spot the Lions a 6-0 cushion, which would grow to 13 with 6:35 remaining in the half on a 61-yard gallop for the major from Robertson, who was turned loose by a great block from Jon Hameister-Reis. Edmonton would answer with just under two minutes remaining in the half, with Arkee Whitlock making it into the end zone from four yards out. McCallum would respond with his third field goal of the evening in the last half minute of play, putting the score at the half at 16-7 in favour of the visitors. If the Lion offense never got fully untracked in the game, it didn’t particularly matter, as the defence and special teams were up to the test. Five minutes into the third quarter, the Esks would tally three more points on a Noel Prefontaine field goal from thirty yards out, but that would be all the scoring Edmonton could muster. McCallum wasn’t done for the Lions, though, registering two more FGs in the quarter, from 28 and 18 yards, before capping the scoring with just under three and a half minutes remaining in the final frame to hand the Lions the final margin of victory.